It was a big year for my family. Everything we had been working for and worried about in regards to moving to Mexico went off without any major hitches. 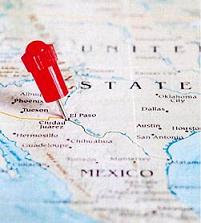 We have been blessed with steady and fulfilling work here in Juarez and that was always the main source of our worries prior to making the move. This year we found an home in great condition that is reasonably priced. (Third times a charm!) We were both even able to go home to visit our respective families, albeit separately. Above all, we feel safe here in Juarez and that is also not something we were expecting. Of course, the best thing that happened in 2011 was the friendships I have developed, both online and off. I may be far from my family and in a foreign country, but the people I work with, the women here in Juarez, and the support I receive from my blog, Facebook and I2US are... priceless. I cannot even begin to describe how thankful I am for my friends and the joy they bring to my life each and every day. There are no words to describe it really. 2011 was pretty amazing and I hope that 2012 continues that trend, but there are definitely changes I need to make this year. In 2010, as the date of our impending move to Juarez got closer, I began drinking heavily to curb my anxiety. Once we got here, I never quite kicked the vicio and I would like to put forth some serious effort to do so in 2012. I want to get back to a point where I am just drinking on special occasions, not every week. Although it hasn't caused the issues I normally hear about when it comes to excessive drinking, it's foolish, horrible for my body, and quite frankly, I can't afford it! Additionally I am going to try to make some healthy changes to my diet and exercise routines that I know will make me feel better all around. I am also going to try to read and write more this year, as well as learn to play an instrument. I know that getting creative juices flowing will help me in all aspects of my life. I hope that everyone has had a chance to reflect on the past year and I want to wish you all a happy, safe and successful 2012. You and your experiences have been such an inspiration to me! Good for you Emily. I hope that 2012 is even better than 2011 for you and your family. Wishing you and your family a great 2012 also. I've enjoyed reading your blog. Wishing you a wonderful 2012!